A random list of things I have seen (besides Kelowna – which I already told you about) in the last 5 days. 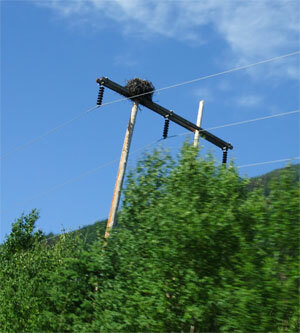 Many, many osprey nests lining the road after the Needles ferry – from Fauquier to Nakusp. Apparently they dig the view of Arrow Lake (which makes total sense, since these huge birds fish) and they build massive nests all over the place on top of the hydro poles. Joe totally and completely relaxed. 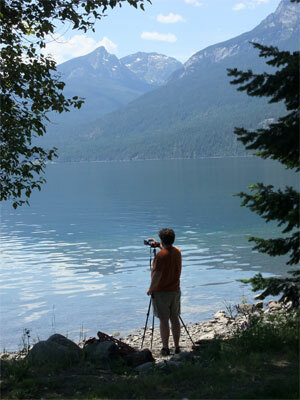 I was more or less his opposite since the place we were at in the Slocan Valley had no cell/internet service, which pretty much made me a hysterical maniac who had to take regular deep breaths just to fake calm. I think I would have been more or less okay if it wasn’t for the Sock Summit looming at me. I went to the local market in New Denver, which was the biggest town in the area. At 600 citizens, it’s still really tiny, but looms over the town of Silverton (225 people) where we were staying. 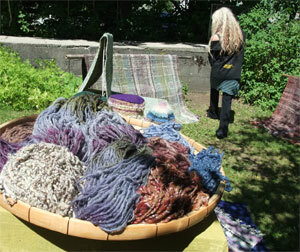 There was good honey, coffee, baked goods and an abundant supply of handspun, knitted things and weaving. We went on a hike through the mountains, and came to a place where you cross a river in a little manual, single cable crossing. 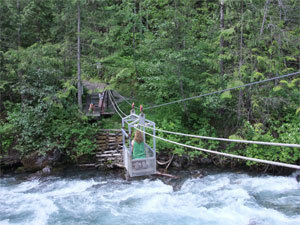 Very scary, but sort of fun, especially with friends who pull the ropes. 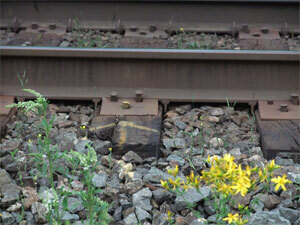 This is the Alamo Siding. 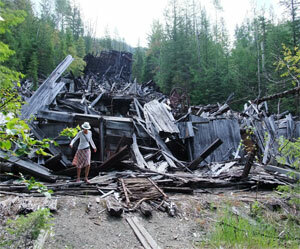 In 1904 there was a mining centre, hydro generator and a population of about 200 here. The Great Depression ruined the fortunes there, and the people moved away and there was nobody to snowshoe in and shovel the snow off the roofs. When the snow accumulated, down the mountain it came. 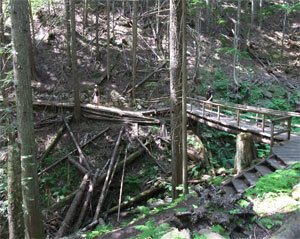 This is part of that same crazy hike. See the people? 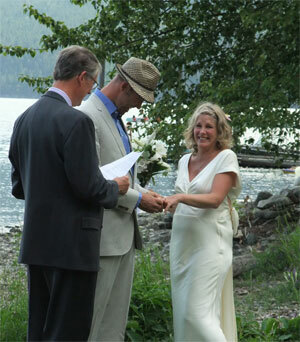 We attended the wedding we went for, wishing well Jeremy and Shannon. Giant Cedars is full of… well. 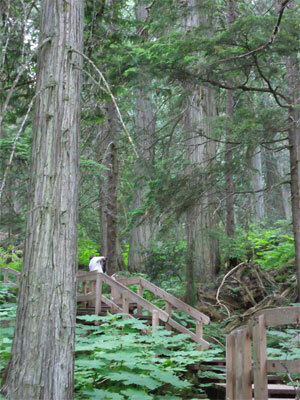 Giant Cedars, and they’re a sight to behold. A sign there tells you that these trees were seedlings when Columbus sailed, saplings when the paint dried on the Mona Lisa, and were already a century old when people were watching Shakespeare’s Romeo & Juliet for the first time. They’re really something, and tall.. .tall… tall. 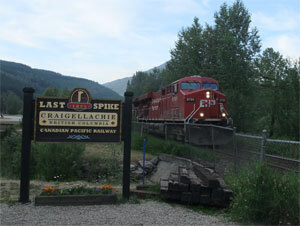 From there we went to see the Last Spike in Craigellachie. The CP railway that spans the country ocean to ocean is a real symbol of unity for Canadians, and an important part of confederation. 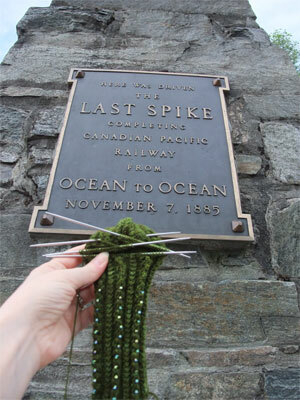 The rail was built from east to west and west to east, and the last spike was driven where they met in 1885, completing one of the most impressive accomplishments in Canadian history. …but the actual spike itself is marked with classic Canadian understatement. 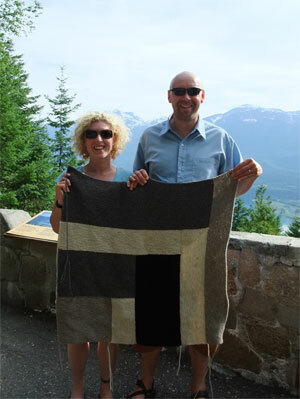 That’s Albert and Robina (our hosts and chauffeurs) holding the blanket, which as you can imagine, isn’t much bigger. 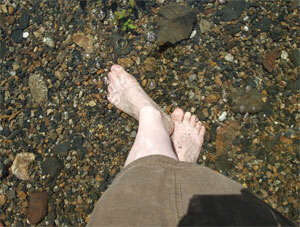 (I am yet to perfect blanket knitting and hiking.) That’ll all change now though, since we’ve left this little vacation behind us, and are back home (where the laundry is) and back at our humble desks. We loved BC. 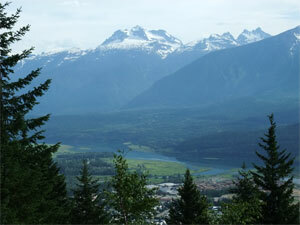 All of Canada has its beauty and charms, but BC really has a motherload.